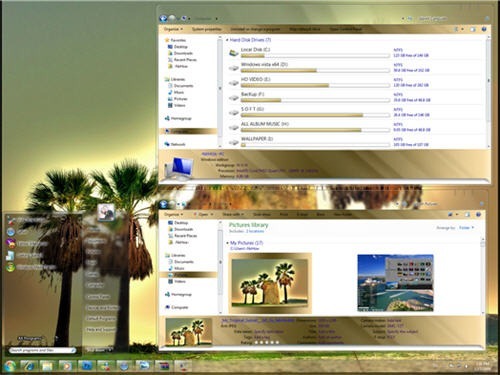 One of the coolest upgrades for Microsoft users with the latest release of the Windows 7 operating system is that we can now change the look and feel of the our computer’s user interface with custom themes. Even better, all of them are free! But how do you find the best custom Windows 7 themes out there without having to plow through hundreds of pages and galleries? Windows 7 allows you to download tons of freebie add-ons through its Personalization Gallery. You can install different color and texturized themes, backgrounds, wallpapers, and fun and creative little desktop gadgets like apps for Outlook appointments and mail, maps, news, system tools, RSS readers, and much more. 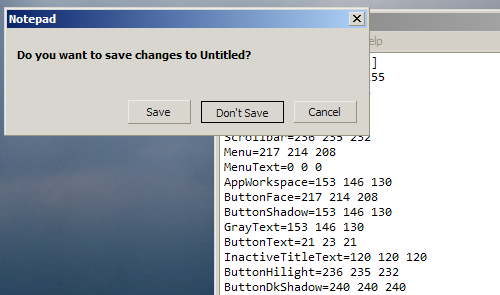 But alas, Windows can’t please us all, and that’s where the members of art and design community sites like DeviantArt come in. There are thousands of Windows 7 themes for all tastes out there, and we spent some time combing through and handpicking some of the best ones so you don’t have to. 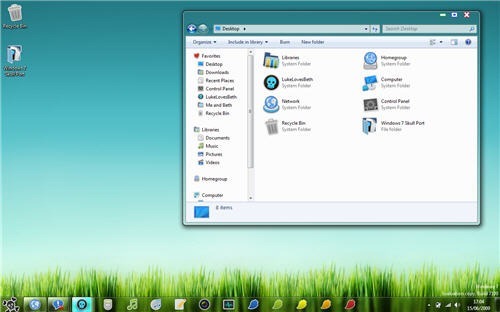 Here’s our list of the 10 best custom Windows 7 themes available! 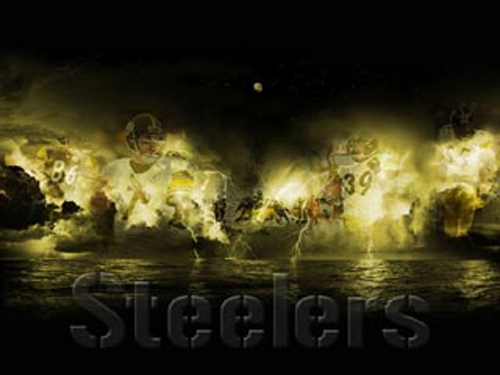 Check out this collection of sports team themes for Windows 7. A fun, bubbly little theme with an interesting top-level navigation bar. Available only for 32-bit Windows 7 OS. 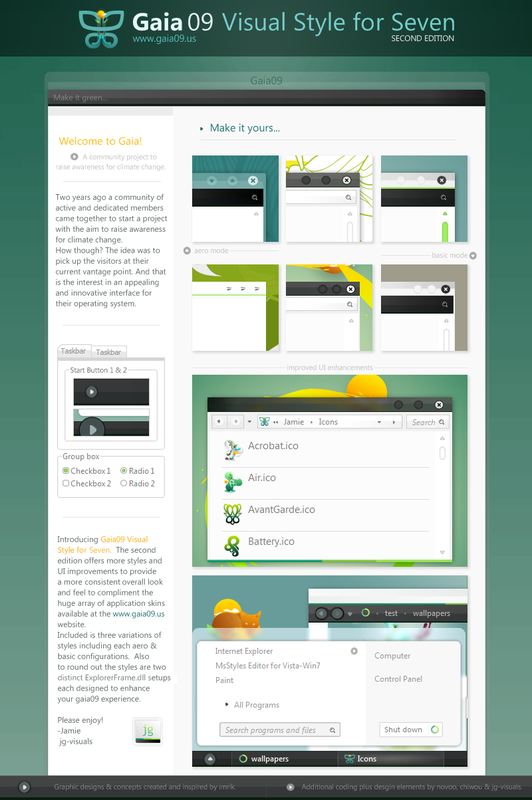 We like this one for the mild green colors and the unique window element icons. Replace that tired old Windows logo with a skull, baby! Sometimes, you’ve just got to get back to the basics. 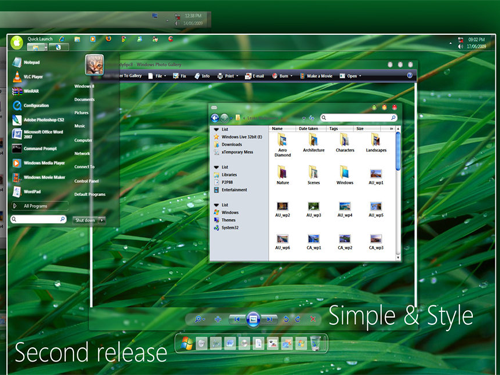 Check out this Windows 7 throwback theme for a nostalgic, minimalist concept. For those who just can’t get enough COD Modern Warfare! Customize your icons, start menu, backgrounds, wallpapers, screen savers, and even sounds! 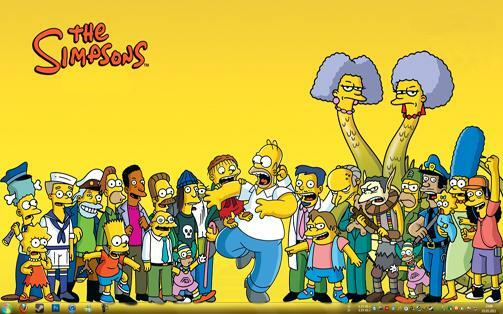 A theme for Simpsonophiles. ‘Nuff said! Seriously, that’s a Windows 7 machine! If you’ve always wanted a Mac but just can’t spare the change, grab this free Mac theme. Ubuntu is making some noise in the world of operating systems, but is it really worth the switch over? In a computing world dominated by companies like Apple and Microsoft, can an open source project compete? 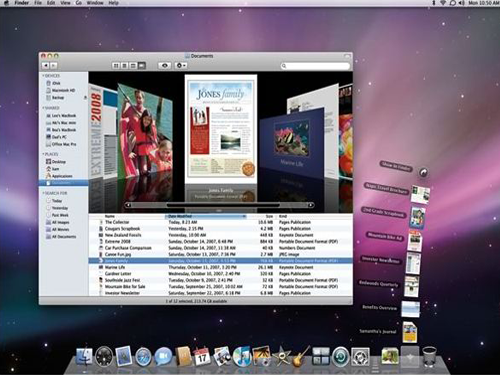 The release of Apple’s OSX Lion and the imminent release of the Windows 8 beta download, is it really possible for there to be room for another operating system? The internet world is a buzz with news the Windows 8 beta download will be available very soon, Apple has just launched its new operating system Lion. The two superpowers are going into battle once again as the world of tablets, smartphones and multiple-device user-ism takes hold. Cloud computing got a shot in the arm with the launch of iCloud, which was a slap in the face for companies like Google, Amazon and Microsoft, who have been working on cloud computing for some time. There is another operating system that is making a little bit of noise, Ubuntu, the modern day version of Linux, if you will. So is it worth installing? It is Free.The biggest advantage of Ubuntu is the fact that it is free. It is a product of, and is being developed by open source programmers around the world. Just like Linux servers for hosting, used by just about every hosting company from GoDaddy to BlueHost (related: save on hosting with a BlueHost coupon). It is their way of getting back at the bigger players perhaps? Why Use it?Just like the operating system itself, all of the applications that run on the operating system are free too. From a global and social perspective, it can be argued that everyone deserves to have access to an operating system and applications no matter what their financial condition is. For countries like Africa, where many millions of people cannot afford an operating system, Ubuntu is a very good solution. Does it Really Work.I hate to be a kill-joy, but after trialing the Ubuntu system for some time, it is obvious there are some serious problems. I am not the only one who says this. There are bugs with the system, applications and compatibility all over the place. Perhaps, with time, and more free effort from open source programmers, the system and applications will improve. It was not long ago Open Office was running like a car that needed some serious maintenance. 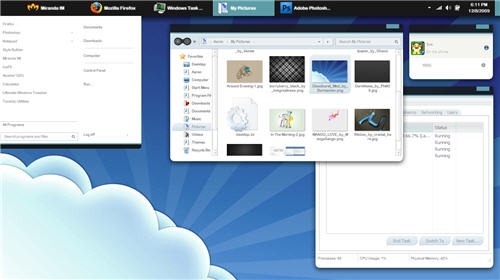 It has changed into a very smooth operating application that easily competes with Microsoft Office. Next Level.Microsoft’s new Windows 8 and Apple’s OSX Lion are already taking personal computing to the next level. They are creating the next generation of operating systems, a change in user interface that is easier to use and works well with cloud computing. Ubuntu is already behind in the race. Cloud computing is finally starting to launch and Ubuntu is yet to be fully functional. This is not to say that Ubuntu will not catch up over time, but it can be said those other players will specialise in what actually works on their operating system. Their operating systems will be tied to the cloud computing services they provide. So in short, is Ubuntu a real option for the average person in a modern Western society? The answer is a simple and resounding, ‘No’. It does not function well for the average user who is used to something like what Apple and Microsoft provide. Inadvertently, we have already been educated and trained by these big companies for some time. Ubuntu is a great social project and ideal. We should thank those open source programmers for what they are doing for the 3rd World. Spam is not only annoying, it is dangerous. The less of it in your business, personal computer or email files, the better. 1. The program should be easy to customize to keep up with the latest technology. 4. It should be consistent and stable. 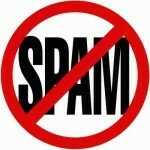 Below are the top 10 anti spam programs based on this criteria. This top ranked anti spam program allows the user to whitelist or blacklist any email they receive. The entire network functions as a whole, and if an email is blocked from a domain a certain number of times, it is then blacklisted from the entire community. The program also protects against email fraud such as phishing and identity theft, and also recognized spammy pictures as well as text. Formerly known as Qurb Anti Spam Software, this top ranked spam fighter starts working immediately upon installation. The program, which won the Editor’s Choice award in PC Magazine for three years in a row, automatically takes your whitelist from your current emails. CA also integrates very well with Outlook Express and Outlook. After connecting to your Internet Service Provider, Email Remover gets email header info and lets you pick those headers from senders that you do not want to receive anymore. The program then deletes those mailings from the mail server. Made specifically for Outlook Express and Outlook users, Cloudmark is another community based program that has over one million users. The program works behind the scenes to take away all unwanted email from your inbox. The program is well known for being able to tell personal emails from spam, and will never delete a personal email. Because of its innovative network approach, Cloudmark Desktop also stops phishing emails as well. ChoiceMail allows you to easily filter your emails by a number of factors, including IP address, domain, or reputation. This program works on a guilty until proven innocent formula, which requires some upfront investment; however once the initial work is done, ChoiceMail does an excellent job of controlling unwanted email. A powerful yet system draining program. However, it ranks as one of the most effective and reliable spam filters around. Perhaps as the developers overhauled the program in 2010, they created a graphic heavy program to attempt to dampen the learning curve. No matter. It is still one of the most feature laden spam filters ont he market, allowing users the power to block unwanted mail in a number of ways. Although this particular product only works with Microsoft Outlook, it is one of the most powerful anti spam add ons for that program. iHateSpam returns to a community based filter, and blocks according to server, IP address, header information, sender’s address, etc. This program actually allows users to get back at spammers by bouncing unwanted emails back to them. The software also automatically reports spammers to the Federal Trade Commission and the owner of the server that the spammer is on. One of the most customizable programs on the list, the program allows the user perhaps the most freedom to make his or her own rules about filtering spam. If you are looking for a simple, easy to use program, this is the one for you. It makes up for its relative lack of features with simplicity. How Not To Guest Post: Are You Doing Things The Right Way? © 2014 The Web Squeeze. Powered by WordPress.